Since winning, at the age of seventeen, the BBC Young Musician of the Year Competition and the Young Artists Auditions in New York, clarinettist Emma Johnson has been one of the UK's biggest selling classical artists. Since her first recording of the Mozart Concerto when she was 18, she has sold almost half a million discs worldwide. She enjoys giving concerts with her hand-picked group of musicians, Emma Johnson and Friends. In her first disc in a new collaboration with SOMM, her handpicked friends are successful artists with international careers: the Carducci Quartet, double bass player Chris West, horn player Michael Thompson and bassoonist Philip Gibbon. 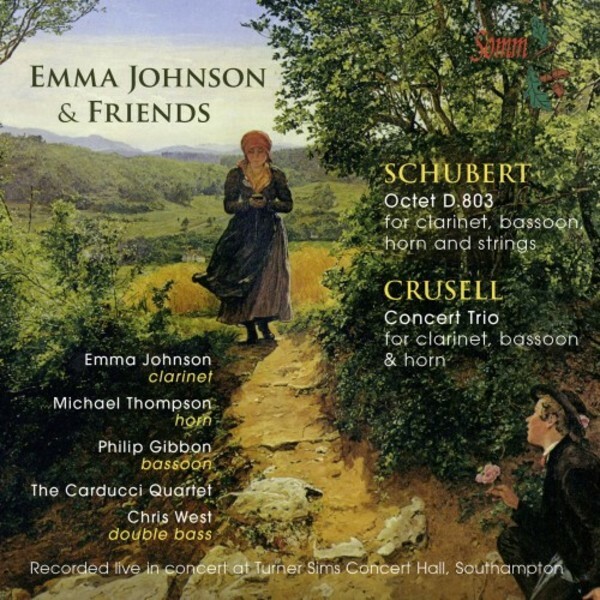 Schubert's Octet and Crusell's Concert Trio were recorded by SOMM in October of 2014 before an enthusiastic audience, during a concert at Turner Sims Concert Hall, University of Southampton. The Octet shows Schubert at his most positive and most profound, resulting in a moving masterpiece of the highest order. It is one of Schubert's most consistently inspired works. Its totality is astonishing, not only in sheer melodic invention but also in structural development and expressive narrative, in large-scale harmonic working and in the interaction of the eight musicians, in terms of individual instrumental colour and unique tonal gradations. During his lifetime, Bernhard Crusell was considered as one of Sweden's leading composers and one of the finest clarinettists throughout Europe. His mastery of the clarinet is evident in the delightful serenade-like Concert Trio for clarinet, horn and bassoon, rarely recorded, if ever. It is a masterly composition, in which each of the three instruments has been given the chance to shine. The Trio is in four movements which follow one another with barely a break, the music seeming to breathe the clean open air of Scandinavia, positive and outward-looking, a characteristic familiar to us from later 19th-century music by Grieg, Svendsen, Gade, Stenhammar, Sibelius and Nielsen.